Surely there are only so many superlatives to name phones? The HTC incredible - is it though? 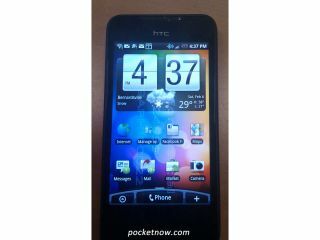 Update: Us Brits now have our own version, so check out our Hands on: HTC Incredible S review. HTC's latest Android phone has been shown off, and looks to be called the HTC Incredible. What's incredible about it? Well, for starters it's massive – rumoured specs have it between 3.5-inch and 3.7-inch in terms of screen size – but judging by the pics from website Pocketnow we'd assume the latter. A 1GHz Snapdragon processor, 5MP camera with dual LED flash and optical trackpad are also included, along with that whopping screen offering WVGA resolution on an OLED display. The phone pictured is supposed to be coming to Verizon in the US, but very rarely does a phone from HTC land in the US and not make it over here – and one that's running Android 2.1 and HTC's Sense UI simply must land in the UK – else we'll be pretty angry. The eagle-eyed among you will have noticed that the HTC Incredible's stats bear a striking resemblance to the forthcoming HTC Bravo – so it's likely what we're seeing here is the US version of that. However, the UK Bravo is still likely to have a UK release date of around March or April, so it won't be long until we find out.